The International Baccalaureate Organization would claim that life-long learners are "inquiring, knowledgeable and caring young people who help to create a better and more peaceful world through intercultural understanding and respect". I think that the IBO's definition of a life-long learner is good, but its not great! I would argue that creativity is the missing puzzle piece that completes the life-long learner of today. The 21st Century life-long learner, must integrate creativity in order to compete in the global community. Technology is exponentially advancing more than ever and we need creative, critical thinkers to innovate and problem-solve like never before. I believe that the life-long learner is a creative, critical thinker, who lets inquiry, knowledge and experience drive his or her learning in order to make decisions and solve problems. These are two very similar definitions, yet one focuses more on character, where the other focuses more on learning. Don't get me wrong, I believe all contributing citizens should aim to be "inquiring, knowledgeable and caring young people who help to create a better and more peaceful world through intercultural understanding and respect". However, I think that the life-long learner will aim to be creative, critical thinkers in order to thrive in the 21st Century. 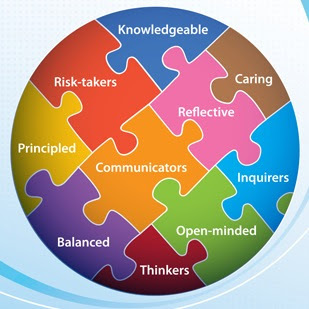 In order to successfully answer this question, let's look at the International Baccalaureate Learner Profile. The figure below displays a Graphic Organizer of a 21st Century learner. In this model, each discipline is equally essential to human development as a life-long learner. Furthermore, each discipline is perfectly integrated in a holistic, well-rounded, educational experience. 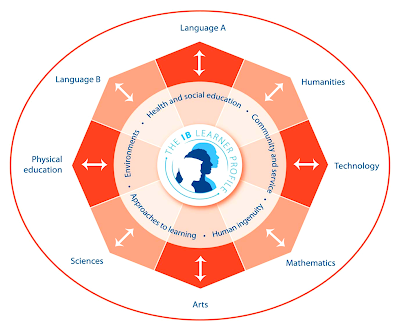 This model of the IB learner profile is exactly what it is ... a model of a profile. I agree that all students should acquire knowledge and character via interdisciplinary education. However, I would argue that what really matters is how the learner applies his or her profile in the real world. Students who attain this well-rounded education will be very knowledgeable and open-minded. But without creative, critical thinking and application, the learner profile remains stagnant. I feel that while schools still implement this great IB program, teachers still need to teach students how to apply their knowledge to real life challenges. Teachers can't forget to implement challenge-based learning and project-based learning into the curriculum so that our students will be prepared to think critically and creatively to solve the global problems of tomorrow. In closing, if we want to prepare our students for their future, then we should not assess them on what they know, rather we should assess them on what they can do with what they know.